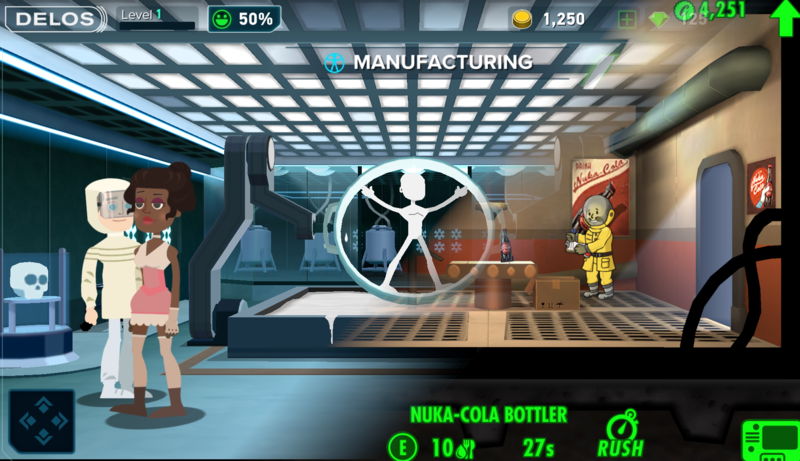 Westworld Mobile landed on Android a mere two days ago, and at the time pretty much everyone remarked that the game was very similar to Fallout Shelter. Turns out, it might have a bit too much in common with that game, as Bethesda is suing Warner Bros. and Behavior Interactive, the developers contracted to make Fallout Shelter for Bethesda. Apparently, WB hired Behavior to make Westworld, and Bethesda alleges some of the IP used in the recent game's creation stems from previous work on Fallout Shelter. It even has some pretty damning evidence. According to the filing, the Westworld game includes a telling bug, with the document stating that "the identical problem appeared in initial versions of FALLOUT SHELTER but was addressed before FALLOUT SHELTER was released to the public." Bethesda believes that is an indication that the games were developed from the same source code. Other similarities including interface actions, similar animations when zooming and panning, and unique geometry features are also noted in the filing. In itself that re-use of code might not be a problem (even if it's a bit disingenuous), but Bethesda also states that Behavior was under an exclusive contract for the work it previously did, with Bethesda as the owner of any and all IP related to the game. That would mean any re-use of that code for Warner Brothers is a violation of that contract and an infringement of Bethesda's intellectual property per the terms of that contract. The suit was filed yesterday in US District Court for the District of Maryland, and among other monetary claims for relief, Bethesda is seeking for the Westworld game to be removed from distribution. Bethesda is suing for breach of contract, copyright infringement, unfair competition, and misappropriation of trade secrets. It seems to be the season for game-related lawsuits, but in the case of Bethesda vs. Warner Bros. & Behavior Interactive, there's a more substantial argument to be made than mere gameplay duplication. If there's any merit to the arguments being made in Bethesda's filing—and an examination of the codebase could easily verify that—WB and Behavior could be in some trouble. Unless they get a comically lenient judge. Were you expecting to see a sensational trial exposing shadowy, corrupt game devs? One that would send shock waves throughout the industry? Well keep right on looking, as this action involving Bethesda, WB, and Behavior has come to a drama-free, and supposedly "amicable" resolution. Exactly what kind of settlement the parties came to remains a secret kept between them, but we do know that Bethesda has dropped its suit for good, and everyone involved is paying their own legal fees. Anti-climactic? Absolutely. But more often than not that's how these legal showdowns play out. Well, it would appear the amicable resolution of this lawsuit has a little juice left to be squeezed. The official Twitter account for Westworld Mobile has announced that the game was removed from the Play Store on January 15th and that the servers will go offline on April 16th, 2019. So if you happen to have any currency still tied to the game, it's probably best that you spend it before the April shutdown date. For more information on the subject, you can read more here.